Alex Lambert for AI Wild Card!!!!! So, I had totally planned to share a post today about how much Alex Lambert had improved in just 3 short weeks, and how I couldn't wait to see what other wonderful things he would pull out of his hat in the coming weeks. Then I died a little on the inside as the results were given, and he was eliminated from the competition. There is no way that Paige, Katie or Aaron deserve to be there and he doesn't. I kept waiting for the judges to save him, and give us 13 finalists like last year. Because seriously...if Anoop Desai deserved another chance....than Alex deserves it 100%. So, during those three performances in the coming weeks...I am just going mute the TV and play this instead and pretend that Alex Lambert is still on the show. Another thing that I loved....Lisa Frank. Instructions: Fold aqua cardstock in half to make cardbase, and round the bottom corners. Round the bottom corners of a white cardstock and purple paper block, and layer to the front of the card. Cut the rainbow rings from glittered cardstock and adhere to the front. 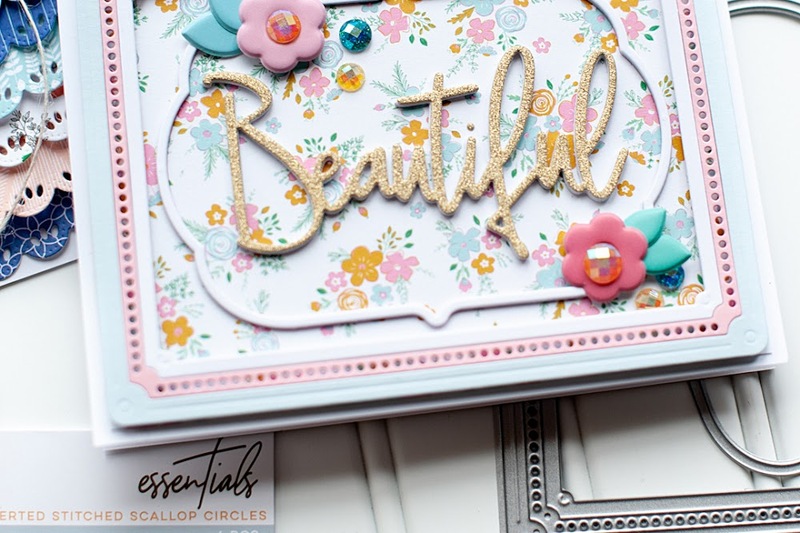 Cut the cloud & its layers from white and glittered cardstock at 1 3/4" using the Cricut Expression and Graphically Speaking cartridge. Layer together, and adhere to right side of the rainbow. 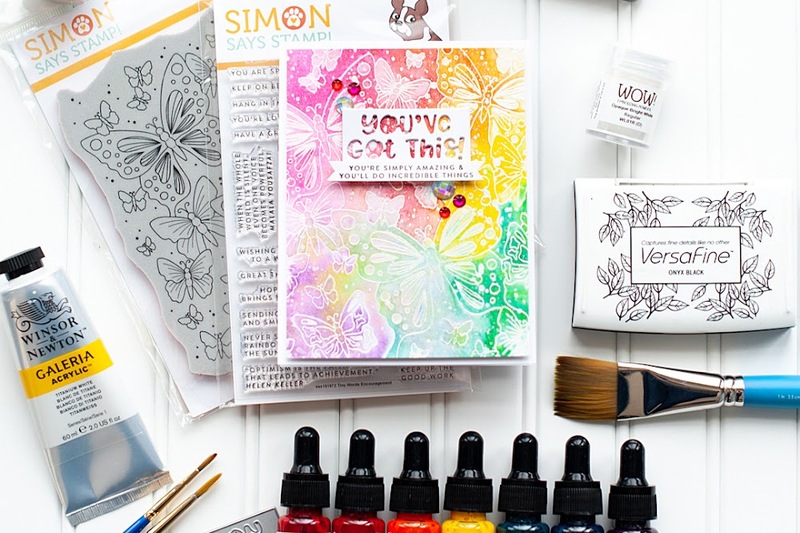 Stamp the sentiment to the middle using violet pigment ink. 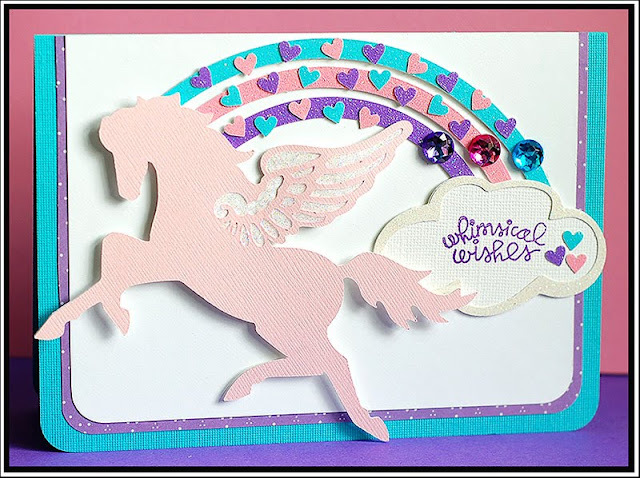 Cut the winged horse & its layers from pink and white cardstocks at 4" using the Hannah Montana cartridge. Layer together and adhere to the front using dimensional adhesive. Glitter the white parts with stickles. 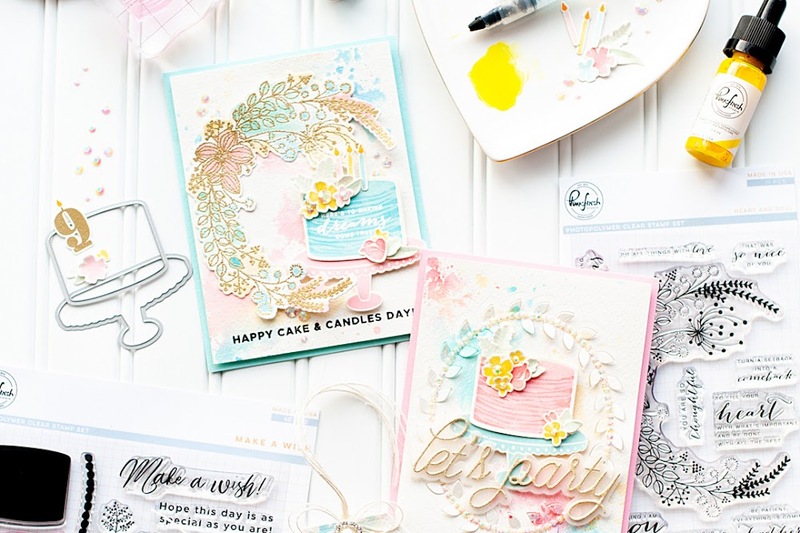 Punch tiny hearts from the glittered cardstock colors and adhere to the rainbow and cloud in a scattered fashion. Accent the rainbow ends with matching colored jewels. I honestly have no idea what I will do with this card. Probably hold on to it for a little bit to see if a possible publication call comes up that it fits. If not, I will put it for sale and hope that someone who stops in at my mom's flower/gift shop knows a girl that loves winged horses & rainbows. Or a boy...I don't judge. Tee hee! One last thing to share with you....I am SO excited for this! EEEEEK!!!!!! I love the card, Lea! I was a huge fan of Rainbow Bright, back in the day. Good times! And... well... I'm a Twi-hard too! I've read the books several times, waited impatiently to see New Moon, pre-ordered DVD's and can't WAIT to see Eclipse! I loved the trailer... Eclipse was so action packed that I think it was my favorite book. what a gorgeous card ! love the unicorn you've cut ! & I totally agree about Alex Lambert !unbelievable ! it's about time they brought back the Wild Card episode ! tee hee ! Oh Lea, I was devastated and if I was in the states I would vote for him in a second! He rocks! Love him! I totally agree about Alex! I was sad to see him go! I don't like mullets, but for some weird reason, he's looks good! And yes, he has improved SO much! Great card too, so fun! Aw, sweet Adam Lambert! I was really sad to see him go, too. He was devastated, poor thing. 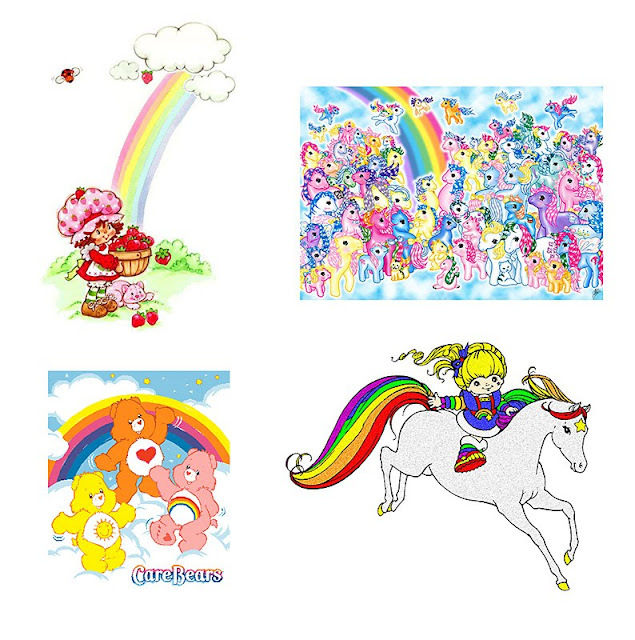 But your Strawberry Shortcake and Care Bears images totally put a smile on my face. It's amazing the "connection" you found between what you loved as a child and what you still love as an adult! Thank you for sharing that discovery with us! When one of our daughters was a young teen, her entire room was decorated with rainbows. Wallpaper, colors, everything so I understand your loves! Lea you totally made my Saturday with the Lisa Frank. I promise I used to collect that stuff like it was gold. LOVE IT. And then the trailer. It's going to be so good. Super card Lea, and I am in total agreement about Alex. Are people mad? By the way, as you know, my name is Enfys (Envis is how it's pronounced). It's Welsh, in fact, it's the Welsh word for rainbow!!!!! Awesome card! And... I think you just helped me understand my love of rainbows... I LOVED everything that you just showed... seriously. I think we are twins... ha! In Greek mythology, the flying horse belonging to Bellerophon was called Pegasus. I've always called winged horses a Pegasus. And if they had a horn, they were a uni-pegasus. I liked Lisa Frank a lot. I remember collecting all the stickers and putting them in sticker albums. Man, where did those sticker albums go? I had puffy stickers, scratch and sniff, fuzzy stickers, glittery stickers... I wish I had those to just browse through again. But then I would have to lug things around with me when we moved. My memories will have to suffice. Shamrocks & rainbows & glitter....oh my!